Global Podcast listener volume is continuing to increase across all platforms with podcast listening trends shifting. Podcast statistics analysis by Blubrry shows a significant increase in Android consumption – the first in many years – specifically among applications that support Blubrry’s one-click Subscribe on Android. With numerous Android apps rising into the top 30 over the past year. Global statistics data from April 2016 comprises a sampling of more than 40,000 shows and over 100 million listener downloads and on-demand podcast plays. The totals do not include Blubrry’s enterprise clients such as ESPN or ABC, nor do they include media buyers that utilize enterprise solutions for measuring their podcast advertising campaigns. The global podcast statistics averages are from Blubrry’s filtered totals, which appear in a client’s individual podcast statistics dashboards. 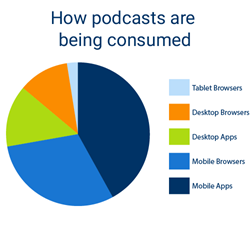 The first data point lays out exactly how podcasts are being consumed. The following data points only highlight the top 30 clients with an additional 100+ clients referred to in any category as other. Blubrry has been a leader in the podcasting statistics space since 2006, when it introduced the world’s first podcast statistics platform. The platform has evolved and is actively managed by the RawVoice / Blubrry team.